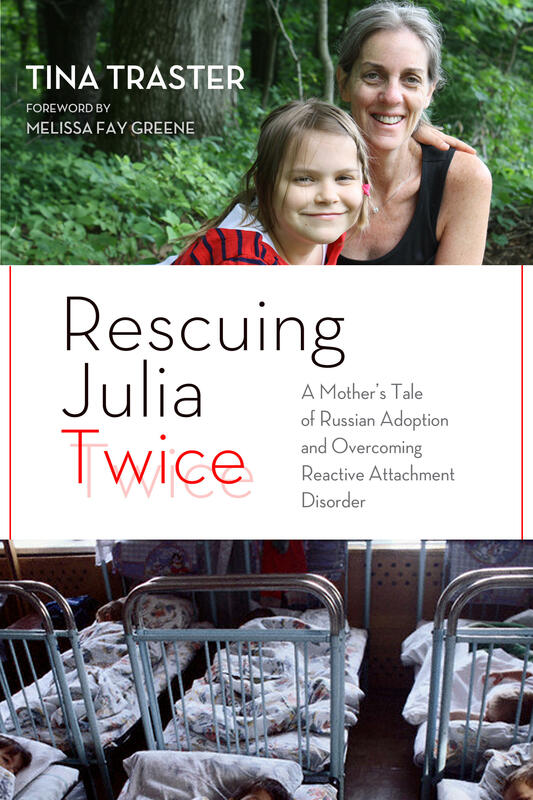 In her new book, Rescuing Julia Twice, Tina Traster tells foreign-adoption story - from dealing with the bleak landscape and inscrutable adoption handlers in Siberia, to her feelings of inexperience and ambivalence at being a new mother in her early forties, to her growing realization over months then years that something was “not quite right” with her daughter, Julia, who remained cold and emotionally detached. Why wouldn’t she look her parents in the eye or accept their embraces? Why didn’t she cry when she got hurt? Why didn’t she make friends at school? Traster describes how uncertainty turned to despair as she blamed herself and her mothering skills for her daughter’s troublesome behavioral issues, until she came to understand that Julia suffered from reactive attachment disorder, a serious condition associated with infants and young children who have been neglected, abused, or orphaned in infancy. Traster describes how with work, commitment, and acceptance, she and her husband have been able to close the gulf between them and their daughter. This segment begins with audio from an episode of the 1980s television series, Fame. In the clip, Carol Burnett performs with the eldest of her three daughters, Carrie. Carrie was a series regular and Carol joined the program as a guest star. In 2002 - at the age of 38 - Carrie died of cancer. The new book, Carrie and Me: A Mother-Daughter Love Story is Carol Burnett’s poignant tribute to her late daughter and a funny and moving memoir about mothering an extraordinary young woman through the struggles and triumphs of her life. Sharing her personal diary entries, photographs, and correspondence, Carol traces the journey she and Carrie took through some of life’s toughest challenges. Formed in the late 1970s in Coventry, England - The Selecter was one of the early acts to sign to 2 Tone Records, home to Madness, The Beat and The Specials. They became an integral part of the emerging ska scene, setting themselves apart from the pack by being one of the only female fronted ska bands. Led by the fashionable and talented Pauline Black, The Selecter released a number of seminal singles on 2 Tone including “On My Radio,” “Three Minute Hero,” and “Missing Words.” A couple of these songs made it on their 1980 debut LP, Too Much Pressure, which charted in the Top 5 in the UK. On Halloween in 2010, Pauline Black and Arthur “Gaps” Hendrickson celebrated the 30th anniversary of Too Much Pressure with The Selecter performing the album live at the Sinners Day Festival in Belgium. This event kicked off the current revitalized incarnation of the legendary band who has continued to write and release new music. Their latest record, String Theory, came out earlier this year. Pauline Black was born to an Anglo-Jewish teenage mother and Nigerian father and was adopted and raised by a white middle-aged couple. She wrote about her life and experience discovering her roots in Black By Design: A 2-Tone Memoir. Woodstock Chimes offers a unique variety of high quality, affordable musical gifts from around the world that inspire, entertain and bring pleasure to people of all ages. Their most recent endeavor, Woodstock Chimes for Autism, was inspired by several uplifting stories shared by loyal Woodstock Chimes customers. One aspect of autism is hypersensitivity to sound. Studies have found that music therapy can assist with some of the challenges attributed to autism. Mozart's music, in particular, has been a blessing for some individuals living with autism. The Woodstock Chimes for Autism features a specially designed clapper, so its soothing tones ring more gently. The chime is musically-tuned to a melody from Mozart's Piano Concerto No. 21. The Woodstock Chimes for Autism also features a bright, nickel-plated windcatcher with the symbolic, multi-colored puzzle pieces. This recognizable and distinctive logo was first created in 1963 by the National Autistic Society. Parents are accused of being both permissive and overprotective, unwilling to set limits and afraid to let their kids fail. Young people, meanwhile, are routinely described as entitled and narcissistic...among other unflattering adjectives. In The Myth of the Spoiled Child, Alfie Kohn systematically debunks these beliefs--not only challenging erroneous factual claims but also exposing the troubling ideology that underlies them. Complaints about pushover parents and coddled kids are hardly new, he shows, and there is no evidence that either phenomenon is especially widespread today--let alone more common than in previous generations. Pamela Ethington is a writer who divides her time between Syracuse, where her home is, and Woodstock, N.Y., where her heart is. Her work has been published in New Millenium Writings. She is a student of author Martha Frankel in Woodstock. In April 2011, Carolyn LaDuke (Sarah's Mom), turned 70 and retired in the same week. While Sarah was in Saranac Lake to celebrate with family and friends, inspired by StoryCorps, she sat down with her Mom for a few minutes and recorded this conversation.